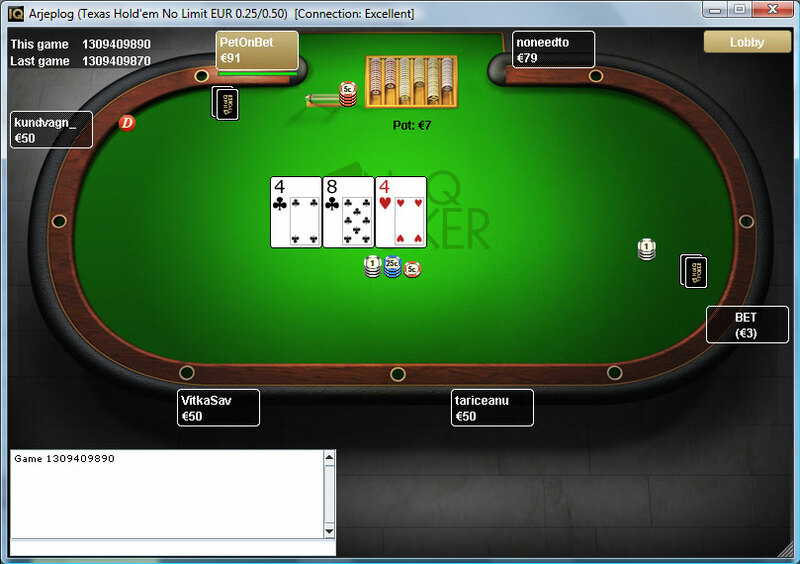 Update (7 November 2012): NoiQ merges with 24hPoker. NoiQ Poker is no more. The poker room has merged with 24hPoker and joined the Microgaming network (leaving the Entraction network behind). Both rooms were/are owned by the same Scandinavian-based company iGame, so it's more of a consolidation than an exciting merger. NoiQ is a solid alternative to Full Tilt as a rakeback room due to the fact that the software is Poker Tracker and HoldemManager compatible. However, the room receives less traffic than the Cake network and the poker client is very basic. 30% rakeback and PT / HEM compatible. Slightly lower than average traffic, but not terrible. The main reason you would want to play at NoiQ is if you want to play at a rakeback poker room that is PT3 and HEM compatible. This is a pretty compelling reason though, as Full Tilt is the only major room that offers this rakeback and tracking software combination (Cake Poker and Aced are not compatible with either). The player traffic is manageable, which means that you can play up to €200NL pretty comfortably (yeah, the tables are in Euros). However, the room is let down by their primitive poker client and lackluster graphics. One of the softer rakeback poker rooms. Player volume is lower than at most major rooms but it's manageable. The fact that NoiQ Poker is one of the less popular rakeback poker rooms right now means that there are far less TAGs and grinders and more casual players than at other popular rakeback rooms like Cake Poker. The competition isn't all ridiculously soft, but I'd say the room is up there with Full Tilt in terms of the ratio of poor players to good ones. NoiQ Poker is in the lower tier of poker rooms when it comes to poker room traffic, but it's at the top of that particular tier so it's not all that bad. There is more than enough traffic throughout the day to be able to multi-table 6 tables at a time up to €200NL. Lobby is very easy to use with it's simple filtering options. Table currency is in Euros (€). May be a good thing depending on what you prefer. Table graphics are basic and bet sizes are unclear. In general, the software is basic with some very plain graphics (as you can see from the screenshots). However, the lobby is easy to use and finding a table to play and taking your seat is a real quick and hassle-free process. The two main things that I do not like about the NoiQ Poker room is the lack of features and the lack of numerical values next to bet sizes. The lack of clarity with bet sizes means that the room will take some getting used to as you will need to pay more attention to the tables during play. This is mostly going to have an effect on multi-tablers, and it's something that you will need to learn to get used to. Other than that, just don't expect to be amazed by the graphics and features (or the lack of features). 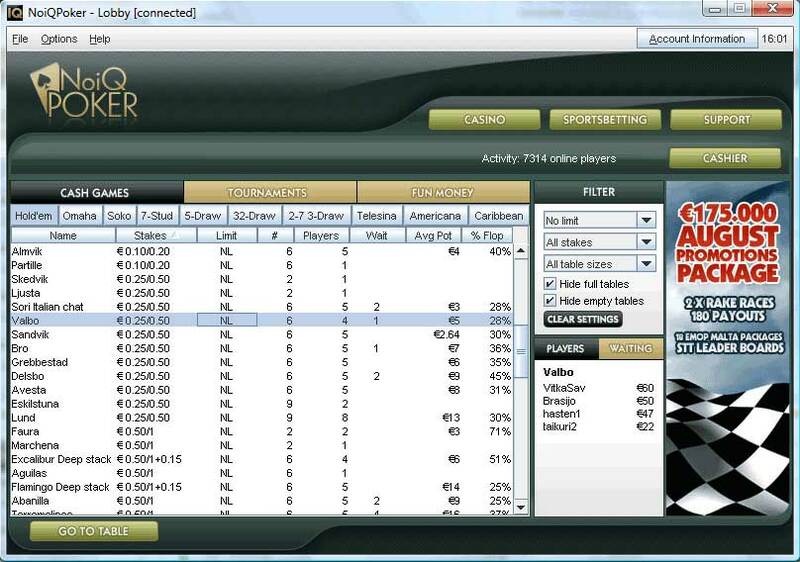 The poker client does it's job, even if it doesn't intend on impressing you along the way. The NoiQ bonus is available to all new players at the room. No bonus code is needed, just make a deposit as normal. However, I recommend using the signup code RAKEBANK when creating an account to ensure that your rakeback deal and bonus money is all in order for when you start playing. The NoiQ bonus redeems at a fairly decent rate, but it's nothing overly impressive. You earn 1 VIP point for every €0.5 paid in rake, and you earn €10 in bonus money for every 100 VIP points you collect. This works out to give 20% effective rakeback from the bonus. You will also be happy to hear that bonus money is not deducted from rakeback calculations. The NoiQ bonus is okay on it's own, but when you mix it with the 30% rakeback deal you end up getting a nice 50% rakeback in total during the bonus period. Go back to the Texas Hold'em rooms.